The [subarachnoid space] is the region or interval found between the deeply situated pia mater and the more superficial arachnoid mater. Extending between these two layers there is a fine meshwork or trabeculae of connective tissue strand. Also, between these two layers we find the CSF or cerebrospinal fluid. The subarachnoid space extends all around the brain and the spinal cord. Where these two layers are in almost direct contact or apposition, the subarachnoid space is small, but there are areas deep in the sulci of the brain, where there can be slightly larger spaces. In fact, there are specific areas of the brain where the subarachnoid space is large enough (with consequent larger accumulations of CSF) that these areas are know as subarachnoid cisterns. A the level of the posterior and lateral aspects of the medulla oblongata the subarachnoid space has communications with the internal cavities of the brain known as the ventricular system. 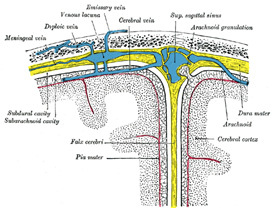 The cerebrospinal fluid is produced deep within the ventricular system in a series of structures known as the choroid plexuses.